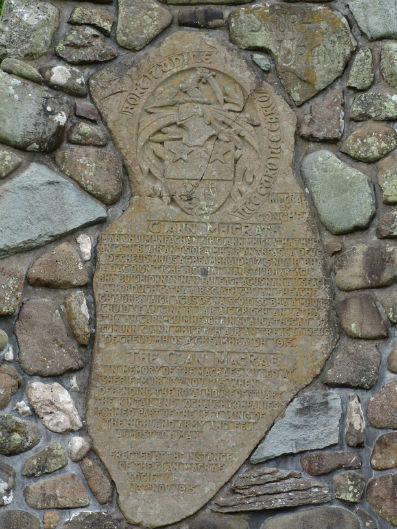 One of the most significant events in Clan MacRae history is the Battle of Sheriffmuir, the first battle of the 1715 Jacobite uprising. Many events led to this uprising, but there were two that really rankled the Scots. The first was the 1707 Act of Union whereby 400 years of Scottish independence were “undone” as England and Scotland united. The second event was the ascension of George I to the British throne as the first monarch of the House of Hanover. George was German, Protestant and supposedly could not even speak English. It is said that there were over 50 closer relatives to Queen Anne who had died, but all Catholics were banned from ascension to the throne by the 1701 Act of Settlement law. So in September of 1715, John Erskine, Earl of Mar raised the Jacobite standard at Braemar starting the uprising against George I. What was their goal? They wanted to depose George and replace him with James Francis Edward Stuart. Jacobite, derived from Jacobus - Latin for James, was the term given to those who continued to support the Stuart dynasty as representing the true heirs to the throne. It is interesting to note that the House of Stuart began with King Robert II of the House of Bruce as the first King of Scotland in 1371. It was on a bitterly cold day then in November of 1715 that an indecisive battle was fought at Sheriffmuir between the Jacobites under the Earl of Mar and George I’s forces under John Campbell, Duke of Argyll. Mar commanded one of the largest Highland armies ever raised numbering around 12,000 men opposing around 4,500 government troops. The opposing armies outflanked each other, with the right wing of each army overwhelming the left wing of the other. Unfortunately, the MacRaes were on the Jacobites' left wing. They fought valiantly for many hours against Argyle's heavy cavalry dragoons. They were pushed back to the Allan Water where they were cut down almost to a man. There is an old saying that there were 58 new widows in Kintail that day. It seems odd to be drawn to such a tragic event, but let yourself feel a sense of awe and reverence when you consider men willing to fight to the death for a cause. It is not an easy trek to even get to Sheriffmuir from the Kintail region. We also know from historical references that the MacRaes were poorly clothed and poorly supplied, but what they had in abundance was a will to fight for what they believed was right and they had the courage to die. Most of us do not even have a clue about the horrors of war and the reality of Sheriffmuir was worse than any battle scene in Braveheart. 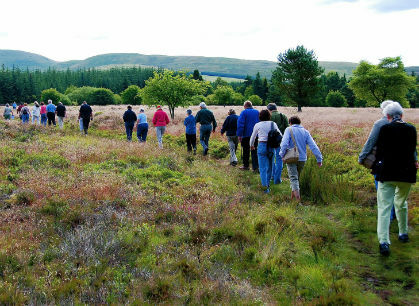 The MacRae warriors at Sheriffmuir were outnumbered and savagely attacked by the British dragoons and each time their lines were broken, the MacRaes rallied again up to ten times that day. The MacRae clan crest badge has an arm grasping a sword with the word Fortitudine which is Latin for “with fortitude”. When you look up the definition of fortitude, you come across “mental and emotional strength in facing difficulty, adversity, danger, or temptation courageously”. The MacRae warriors at Sheriffmuir displayed all of this and so much more. These warriors did not surrender, but continued to rally again and again and surge forward as they fought superior forces unto their very death that day. November 13, 1715 was a shattering day for Clan MacRae, but we honor the strength of character and the integrity of these MacRae warriors. 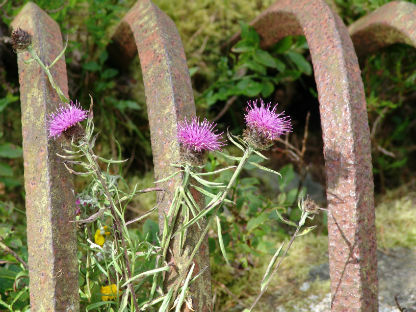 In a day and age where loyalty and courage are hard to find, remember Sheriffmuir and the fallen MacRaes. 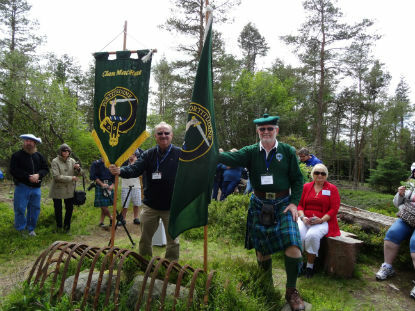 As you put on your MacRae tartan and as you pin on your clan crest badge, remember their courage and shout “Sgurr Uaran”, the war cry of Clan MacRae. It’s in your blood to have fortitude - to have mental and emotional strength in facing difficulty, adversity, danger, or temptation courageously. So, rise up MacRaes into the true identity of your warrior blood! Sgurr Uaran! 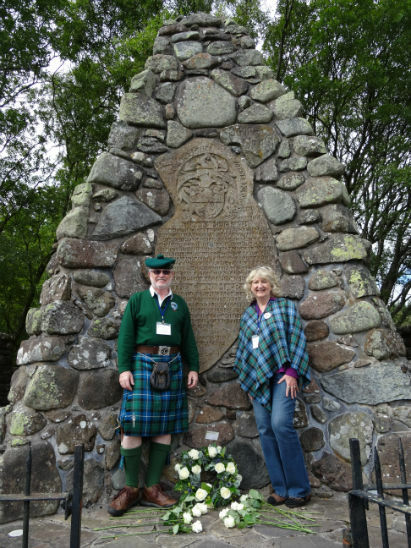 In memory of the MacRaes killed at Sheriffmuir, 13th Nov. 1715, when defending the Royal House of Stuart. The Kintail and Lochalsh companies formed part of the left wing of the highland army and fell almost to a man. Erected at the Instance of the Clan MacRae Society. 13th Nov. 1915.